In the 122 years that Nintendo has been in business since its start in 1889, there has been one constant: they make playing cards. It is the product range which provided the foundation for the company, and although their importance as driver of revenue has been greatly diminished in the last thirty to forty years, they are still selling them today. Over the years, Nintendo has produced many different types and styles of playing cards. One of my favorite card series is called Ehon Trump (絵本トランプ). They come in cute television-shaped cases. 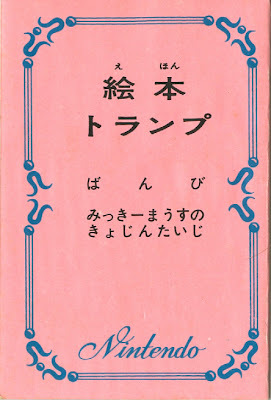 'Ehon' translates to 'picture book', and refers to the second use of these cards (besides their regular playing card function), which is a creating your own cartoon show. The Ehon Trump series features many different manga (cartoon) favorites, including Disney figures (Donald Duck, Mickey Mouse, Bambi) and Japanese television heroes from the 60s like Obake no Qtarō (オバケのQ太郎), Space Ace (宇宙エース) and Spaceboy Soran (宇宙少年ソラン). 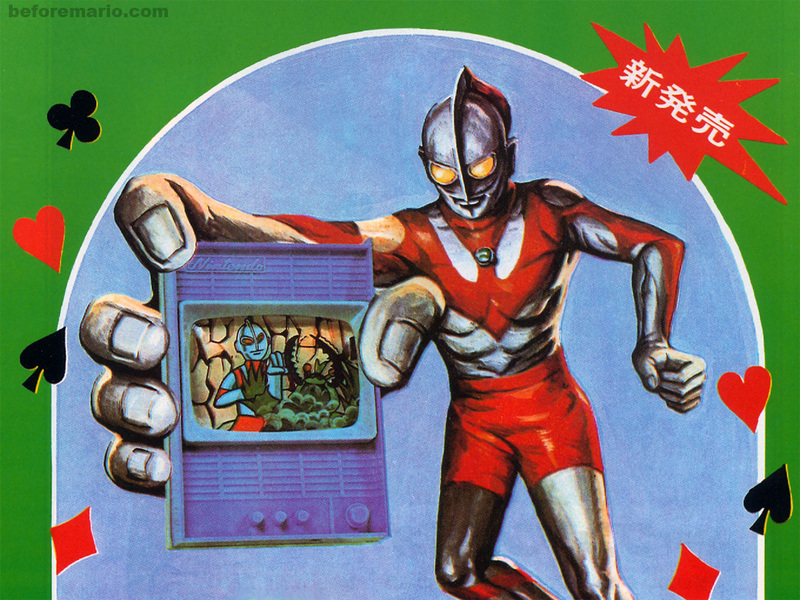 Another important figure licensed by Nintendo for inclusion in the Ehon Trump series is Ultraman. Ultraman was used prominently in the card series' promotional material. 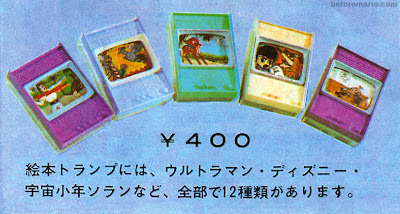 The advertisement states "Twice the fun: nice trump cards and manga" (「楽しいトランプゲームとマンガで２倍の楽しさ！！」) and "Comes in very nice television type case" (「とってもすてきなテレビ型ケース入」). Ehon Trump was released around 1965. They cost ¥400 per pack of cards. This logo can also be found on the back of the case. Each Ehon Trump pack contains the regular 52 playing cards, 2 additional joker cards and a story booklet. 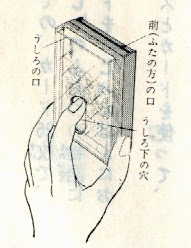 The cards are sealed with a card tax stamp, which was required for playing cards in Japan up to 1989. 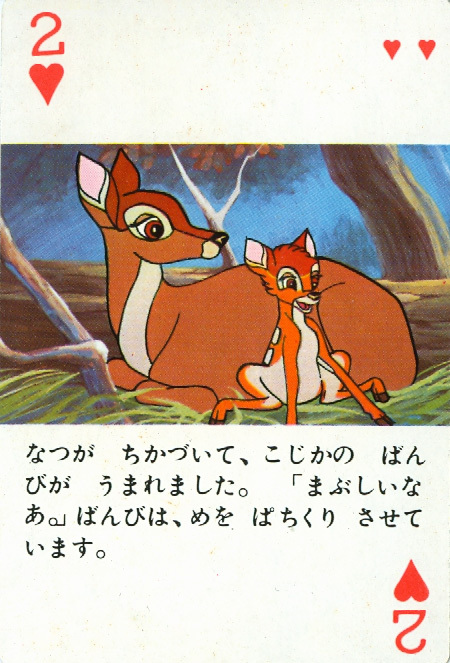 Each Ehon Trump pack focusses on the adventure of a single character (Bambi in the example below). Illustrations on the front of the cards tell the story in 52 pictures. 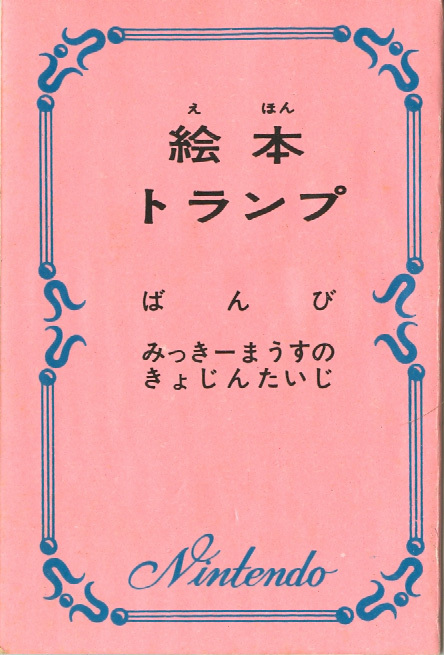 This story is also the topic of the accompanying booklet. 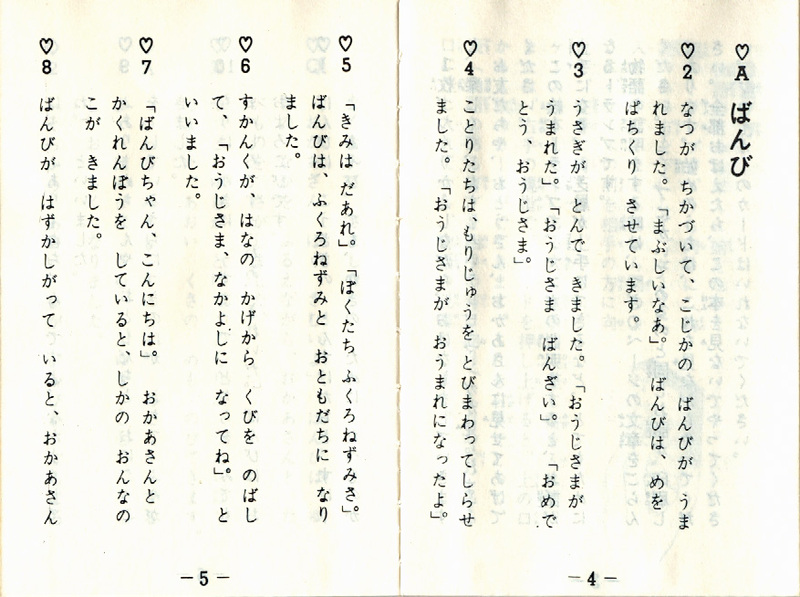 The booklet contains a paragraph of text for each of the cards, written in the traditional Japanese right-to-left, top-to-bottom style. The same text is also included on the card, underneath the picture, so you can read the story by flicking through the cards. You need the booklet when you present the story to a (captivated, surely) audience. 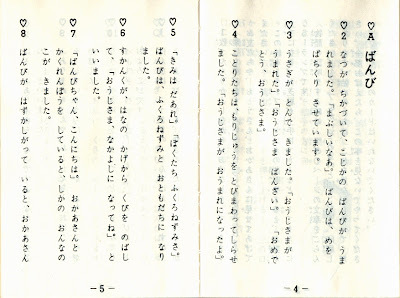 You would place the television case upright on a table, and show the cards one-by-one, while you read out the story. Two slots in the top of the case allow for cycling through the cards without the need to open the case. An opening in the back of the case makes it possible for your index finger to push the card in the back up, after which you could move it down again in the front of the pack, where it would show the next part of the story. The pictures neatly fit the television screen. This way, with a little imagination, you are creating your own cartoon show. 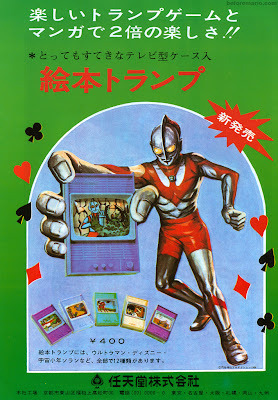 The Ehon Trump, like all Nintendo cards of that era, where sold in a cardboard cover, which contained a nice pattern of Nintendo logos and card symbols. In 1970, packs of Ehon Trump were used as give-away in a promotional campaign for N&B Blocks. Are you interested to see more posts about Nintendo cards, or should I stick to the toys and games? Great post, I am quite interested in these Nintendo cards and say you should do further posts about them. They are, after all, the earliest type of Nintendo product! That card tax stamp was quite interesting, I never knew they used to have those. Nintendo cards (and certainly unusual ones like these) are definitely interesting but it may be easy to get bogged down in them as there are so many. Just sticking to the most important / interesting ones sounds like a good plan. I'll also take this opportunity to say thank you for taking the time to write this blog, you've already built one of the best resources for Nintendo's product history on the internet, and certainly the best english language resource in my opinion. Thanks for all your hard work! I really like to know more about the Nintendo origin, the Hanafuda Cards. Maybe there were some special editions. By the way, I don't know how to play. wow, I am at the collector of Nintendo playing cards and other Japanese playing cards that were made in Disney and animation. I have a lot of mine listed on my Facebook site, playing cards of the world. I'm always looking to add more to my collection but they are hard to come by thanks for the share. Hi Jo! Love your collection of Nintendo cards. Will see if I can post some more cards on my blog in the future. Have you ever seen a Nintendo deck of playing cards that come in a hinged Nintendo branded tin? I purchased one a few years ago at a flee market and I can't seem to find anything on the online.